What It’s About: Connor MacLeod (Christopher Lambert), born in the Highlands of Scotland in 1518, dies in battle . . . only to rise again. Driven out of his village by this unholy occurrence, he is driven from his village. A few years pass; Connor has found some peace in marriage to Heather, working as a blacksmith in a seemingly isolated tower, when he is visited by the dashing swordsman, Juan Sanchez Villa-Lobos Ramirez (Sean Connery). Ramirez explains to Connor why he didn’t stay dead. He is one of a handful of Immortals walking the Earth, preparing for the time of the Gathering when only one will survive. Immortals engage each other in duels, trying to behead one another, as that is the only way to kill an Immortal and claim his power. Ramirez proves to be one of the good Immortals and trains Connor, but Connor is also pursued by the man who originally slew him in battle, the most evil Immortal, known as the Kurgan. In the present day of 1985, Connor has survived through the centuries to be one of the last remaining Immortals as the time of the Gathering is at hand. He poses as Russell Nash, an antiques dealer. When a fragment of Connor’s katana is retrieved from a parking garage after one of his duels,he draws the attention of Brenda J. Wyatt, an expert an ancient swords working with the police department. Finding evidence of Connor’s false identity, Brenda is drawn into the final conflict between Connor and the Kurgan. In the end, there can be only one. Why Watch It Today? 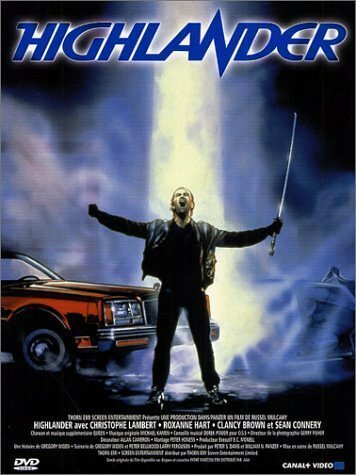 : One undeniably great feature of Highlander is the soundtrack, particularly the songs of Queen. Celebrate the life of front man Freddie Mercury today, on the anniversary of his death in 1991. This entry was posted in Action, Adventure, Based on a TV Show, Epic, Fantasy, Fight Film, Movie of the Day, Swashbuckler, Sword and Sorcery and tagged bad accents, Christopher Lambert, Clancy Brown, Freddie Mercury, Kurgan, MacLeod, Queen, Scotland, Sean Connery, sword duels, there can be only one, who wants to live forever.